Catching a combination of dramatic lighting combined with no wind at Dream Lake can be very difficult. 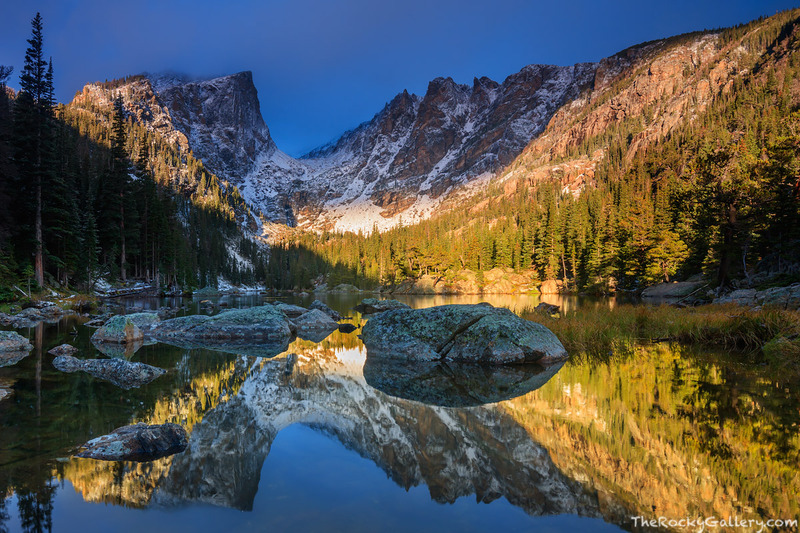 Every season photographers, hikers and visitors to Rocky Mountain National Park make their way up the 1.1 miles of trail to see this iconic Colorado location. It's likely to be a beautiful bluebird morning when these travelers make their way to Dream Lake and its just as likely to be windy. On this October morning after fresh snow had fallen on the peaks but Dream Lake had yet to freeze over, I was on my hike back down from Lake Haiyaha at sunrise when through the trees I could see these rays of sun spotlighting the fresh snow on Hallett and Flattop Mountain. I ran down the trail and setup my photography equipment at the outlet of Dream Lake. I was only to make a couple of exposures before the sun went back behind the clouds and the sun disappeared from view for the morning. Photo © copyright by Thomas Mangan.